As you have read on my previous blog and information on this site, breast thermography is an excellent tool for preventive breast health. Unlike mammography, whose function is to detect a tumor after it has already formed and grown big enough to be seen by the mammograpn (typically 1-2 years), the function of the breast thermogram is to allow prediction on risk of breast cancer. It shows changes typically associated with the formation of cancers. Thus, the clinical use of breast thermography is preventive (allows you to take action before the cancer) while mammography is corrective (take action after the cancer is already there). The thermogram is rated according to risk (level 1 to 5) with levels 1 and 2 yielding a 99% confidence that there is no breast cancer present. A level 5 risk suggests a 90% risk of cancer already present (even if it just recently started and is microscopic). As the pattern suggestive of declining breast health evolves and becomes more pronounced, the risk level rises. Another way of looking at this is that the pattern shows a gradual decline in breast health, i.e., statistically getting closer to having cancer. Similarly, if no change is taking place year after year, this suggests a stable breast health condition. It is always nice to know that no new vessels or hot spots are developing. It is even more rewarding to see that the pattern is improving suggesting that whatever is being done is (statistically) reducing the risks. With 1 in 8 women at risk for breast cancer, it is comforting to know that what we are doing is helping our health. We don’t have to be sitting ducks waiting for bad news. It’s a great feeling to know we can have some visibility and control here. Another interesting use for the breast thermogram is to help monitor hormone replacement therapy. When estrogen dominance is present (an imbalance of estrogen and progesterone which favors a stronger estrogenic expression), we begin to see a pattern suggestive of higher risk. I use this to help me adjust the dosages so that the thermographic image remains as healthy as it can. At times, I even see a healthier appearance after starting the HRT (I only use bio-identical hormones). If the thermogram starts to look ‘worse’, I adjust the hormone level down until it looks healthy again. It is imperative that a high resolution camera be used (at least 80,000 pixels) and both colorized as well as grey scale be depicted. The color shows regional heat patterns while the grey scale is excellent for demonstrating vascular patterns. In the next blog, I’ll describe some of the methods I use for improving breast health. This approach tends to make the breast tissue more uniform and less lumpy as well as tending to make the thermographic image healthier looking. The advantage of the thermogram is that if the image does not appear to be getting healthier, we try a different approach until we (hopefully) find what does work to improve breast health. Many people that have heartburn or a mid-chest pain after eating are told they have a hiatal hernia and offered either surgery or are told they have to live with it. There is another option. Sometimes we can fix an uncomplicated hiatal hernia with simple common sense and without going to great lengths. Let’s see what is a hiatal hernia and what a logical approach to fixing an uncomplicated one might be. Hiatal Hernia: Food enters the mouth and travels down to the stomach via a tube called the esophagus. This tube (the esophagus) has to pass through a 'hole' or opening in the diaphragm (which separates the chest cavity from the abdominal cavity) called the esophageal hiatus. Sometimes the upper portion of the stomach slides up above the diaphragm and food can get stuck there (pressure pain) or the stomach acids can wash against the unprotected esophagus (burning pain or 'heart burn' or 'acid reflux'). Once these contents wash down over time (we can assist the process by drinking some water) the pain clears and may return another day. When the stomach or abdominal contents bulge up through the opening in the diaphragm, they are said to herniate through this hiatus, hence a hiatus hernia. If the contents become twisted, we might have a life threatening situation that requires surgery. If it is a simple problem, we might be able to fix it with no more that some drinking water. A simple way to pop the stomach back down below the diaphragm where it belongs is to make it heavy enough until gravity pulls down on it. It's the next best thing to reaching in and grabbing the stomach and giving it a yank downward to pop it back down to where it belongs. So how do we do that? I'll tell you how, and how I found the method (which was probably discovered by many people on their own in a similar fashion). Two years ago, my father (88 years old at that time) was visiting me. At 3AM I heard him calling me from his bedroom. I came over and he said he had a severe chest pain. You can image what was the first thought in my mind. But then, he said this has happened a few times, tends to come on when he bends forward and often clears on its own after 20 to 60 minutes. He had already been checked by his doctor and it was not his heart. I did an examination and found it was not a rib strain, it did not appear to be cardiac so I thought it might be some food stretching the lower portion of the esophagus, likely a hiatus hernia. I would have reached through his belly to grab the stomach and pull it down if I could. Since I couldn't, I did the next best thing. I had him drink at least 3 full glasses of lukewarm water in order to place a 'weight' in his stomach. Then, to make the water momentarily heavier, I asked him to make a quick dip by bending his knees thus allowing the body to fall down a few inches and then to catch himself and stop the downward movement. He did it poorly, but fortunately, I had a rebounder (mini-trampoline) so I asked him to get on it and bounce a few times while I supported him by holding his hands. He did that well for about 5 or 10 times. The pain stopped immediately. Two weeks later he called me from his home at 2AM to tell me he was having another pain attack. I told him to drink the water and try doing the same by bending the knees and holding onto something for support. It worked. He has not had any more attacks since then and no surgery was needed. I've since used this approach with several patients and have had equally good results. Disclaimer: The above article is for educational/informational purposes only. It is not meant to give specific medical advice. Before trying any of the above suggestions, discuss it with your doctor. Not everyone can tolerate drinking this quantity of fluid or the physical exercise component of this technique. Wow, this is great information! My 14 year old daughter has a hiatus hernia and serious GERD, I believe caused by Lyme Disease(diagnosed and undertreated in 2003) and Bartonella, another tickborne disease, as both of these bacteria like to reside in the gut. Because of her GERD, she was diagnosed with Barrett's esophagus last year. Now, being treated for Lyme and Bartonella, her GERD is really flaring up. I will have her try drinking water and doing quick squats like you suggest and see if it helps her. I hope so! I did this experiment using a thermal imaging camera (the MHS-5000) to look for changes in temperatures using a Cell phone. Note that after several minutes of using a cell phone, the right side of the head is slightly warmer than the left side. What is interesting is that the entire head became warmer by 2oC (3.9oF). It is likely that the internal structures (i.e., brain) not visible to the camera also warmed up. I don’t know what the physiological or medical implications of this temperature rise are but it does make one think. A thermographic image is produced by surface temperature differences. The camera senses these temperatures and converts each (thermal) point into a point of color which corresponds to the point’s temperature. The temperature gradient follows a spectral pattern in which blue is cool and red is warm. Note that there is an increase of approximately 2oC (or 3.9oF) after 10 minutes on the cell phone. I sell no telephone related products and do use a cell phone (but whenever I can, I now use a device to distance the phone from me). I just thought this was too interesting not to share. Awesome. Thank you for sharing this. It definitely does make one pause. It is something I have suspected for some time (thermal increase due to RF/EMF radiation exposure). It would be interesting to see the image after using some of the anti RF or EMF products that say protects one from exposure.Thanks so much. I think it's natural behavior about the temperature increasing when conversing on a cell phone for a while. You know, the surface temperature of the cell phone can reach to 40oC~50oC when the phone is on talking mode. Many women are concerned about the recent recommendations to limit mammography to women over age 50. On November 16th, the U.S. Preventive Services Task Force (USPSTF), an independent panel of doctors and scientists that make recommendations to the U.S. Department of Health and Human Services, announced a change in their mammography screening guidelines. The new guidelines recommend several changes. The most controversial change was that screening mammograms be taken every 2 years for women age 50-74 versus their old guidelines which recommended screening mammograms every 1-2 years starting at age 40. This may actually be a blessing in disguise since women might now be motivated to look at other options. There is an option which is non-invasive and very accurate. Thermography! 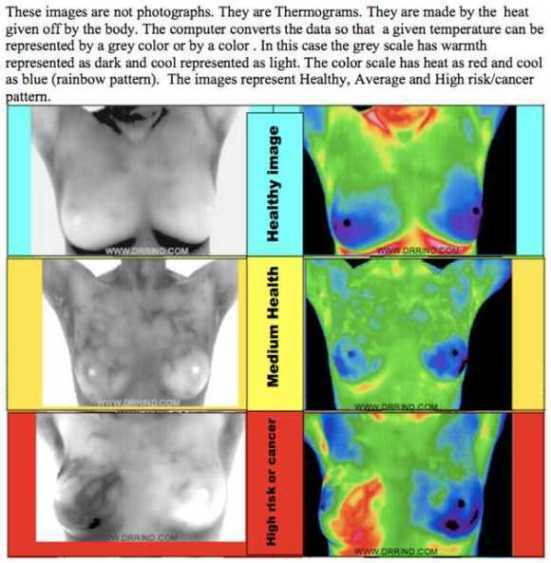 Thermography looks at a woman’s risk for developing cancer (i.e., best use of thermography is before the problem) while mammography is used for identifying a problem after it is present and has been there long enough to start becoming visible. If these technologies were to be compared to working with the weather, then a thermogram would tell you what the chance of rain is and if over time the weather is getting better or worse. The mammogram would be there to tell you how many inches it already rained. In other words, the thermogram is best used in the ‘preventive’ mode (before the cancer comes) while the mammogram is best used in a ‘corrective’ mode (it only begins to give information about a cancer once the cancer is there). Each has a different purpose. A colleague of mine put it this way, “using a mammogram for preventive care is like trying to drive forward by using the rear-view mirror”. Similarly, using a thermogram to image a tumor is not an appropriate use of that technology. The assessment for tumor location and size would be obtained with a mammogram, ultrasound or MRI. In a car analogy, the thermogram is there to let you know that a rough road is coming up, likelihood of potholes etc. and provide time to make a course change. The mammogram lets you know how big the pothole was that you already hit. An additional benefit to thermography is that it is a sensitive indicator of change in the vascularity and general health appearance of the breast. It can show increased/decreased vascularity (see the grey scale images above), thermal symmetry or new hot spots that were not there before. It can show unhealthy changes in the breast years before a cancer forms in that breast. This allows for monitoring of those changes in response to health and lifestyle changes. If the right things are being done, then we see an image indicative of a healthier breast. It is important to remember is that not all thermographic equipment is equal. The resolution should be no less than 80,000 pixels. Also, the unit should be able to not only take color but also black and while thermal images. The color images are best for demonstrating regional differences and changes while black and white image is much better for seeing the vascular patter (See example below). Each has a different but equally important function. It is also important to work with a doctor knowledgeable in breast health improvement. Check out this recent news story which aired on WUSA Channel 9! The story features my office and explores the benefits of this life-saving proceduere.